On a day when the market is anticipating greater central bank intervention, it seems more appropriate to look back to the annals of history. I have long been of the opinion that the long-term historical pattern is that bear markets tend to bottom out at DJIA:AU 1:1. We have a way to go yet — either in terms of a fall in stock prices, or a rise in the price of gold. And with our faithful Keynesian friends promising to print ’til stock prices stabilise, it looks much more likely that gold will be the one making the major move. I will not try to forecast prices beyond the 1:1 ratio, but at a push I would facetiously say long term price targets remain at $36,000 for both, for obvious reasons. $36,000 is a significant number for more serious reasons, too. It is the price gold would have to rise to to back all global financial assets at current valuation. This entry was posted in Economic History, Economics and tagged barry eichengreen, bear markets, central bank intervention, dow36000, gold36000, paul krugman, price of gold. Bookmark the permalink. P/E Ratios have gone back to sensible levels and this graph is compelling. It would be nice to be the 0.01% buying up all those stocks in 2008! We truly are sheep and cattle. Because we never know when WW3 starts, who can be certain when to buy equities? I know the Federal Reserve may have an influence in the USA, but from a Global perspective, I see a classic head and shoulders pattern emerging. If the Global Dow does not break the right shoulder, this could have consequnces for Global market confidence. If it trends up we could see a rotation out of Gold, by the main national central banks, into other asset classes. This is similar to pre 2000. The only place in the world not presently injecting huge swathes of liquidity into markets is Europe, which very soon will be if they do not want to trigger a global mega-crash. If you have tone of money or if you have access to easy money of course everything is cheap. If you have to work your arse off for every penny earned, nothing is ever cheap but getting more and more expensive by days. 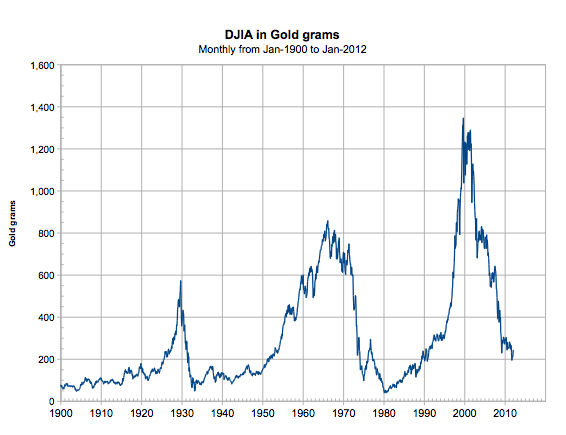 Can’t never understand why Gold is cheap at almost $1900 once. Who has that kind of money to buy gold? Average working people can only buy food, gas, pay rent, healthcare, and tuition etc etc. Why would they starve themselves to death living in misery but holding an once of gold prepare for the apocalyptic coming? What you need tomorrow for when you don’t have today? Poor people live for today while the rich live for today and tomorrow and the days after tomorrow. Gold is the rich people game. The Central banks and governments are using Gold as one the bucket/pool to trap to contain some of the the excessive money printing (liquidity) they created therefore inflation won’t be running wild out of hand. May be that’s case anyway. However the Gold pool is such a small one. Stock market is a much bigger pool to catch the “liquidity.” Stock market will follow gold going up from this point, it’s said. But all are merely numbers on papers. All that fake trillions fake wealth created from nothing can disappear overnight, like they do before many time, back to the money Heaven. So if you have lots of capital this is the time for you to gamble. For the gamblers you have two outcomes: 1) No Pain No Gaim. 2) Pain No Gain. For the House: Of course it’s always Only Gains No Pain. Does Gold really make life better happier: Places like India, lots of people possess gold but their country seems haven’t been in good runs: illiteracy, atrocious poverty, dirty filthy appauling public hygens and disease + way over populated. Moreover Gadaffi couldn’t save his life for all that hundred tones of Gold he had. So Gold is not the anwer for the apocalyptic coming near you. You have it wrong my friend. Gold is the free man’s money. Any living person right now can invest in gold and silver that it is unfathomable if you do not. You can buy gold grams from silversaver.com using a dollar cost averaging program. It is so simple and so easy you can even auto deduct money from your monthly paycheck on predetermined days and they can either store it for you for a fee or ship it to you. There will be the biggest change of net wealth in the next few years as long as you participate before the cataclysms hit. I can explain in much further detail but you should read the book “How to Profit from the Coming Devaluation” by Browne or go to Casey Research.com and read up on some of their economic outlooks. GATA also has the best short conference published online, spoken by John Embry sometime in early-mid Febuary titled “Debt Saturation Ensures much Higher Gold Prices”. I highly recommend reading that article as it will enlighten you in many areas. The point you’re missing is the flipside of the “gold is cheap” argument: my argument is actually “gold is cheap in comparison to stocks”. The argument could also be phrased as: “stocks are expensive”. The American economy still dedicates huge resources to pension funds. Most of this (something like 97%, if I recall correctly) is in the form of stocks and bonds, which are both very overpriced right now; the Fed’s policies are explicitly tailored to reflating the stock exchange, and taking bonds out of the market, to “lower yield” (thus puffing up the price). Pension funds and mutual funds would do well (and would have done well for the last ten years) to hedge counterparty risk with physical metals. Very interesting. You’re not comparing me to George Soros, though? Hehehe. Aziz compares himself to Nassim Taleb; ends up sounding like George Soros. Unlike most economists, I know a thing or two about unintended consequences. Interesting that Islam considers only real commodities as money (like gold, silver, beads or whatever, anything but paper with digits printed on it, or worse electronic digits on a computer with no corresponding commodity to back it). We are also forced to use fiat money with legal tender laws and because taxes to the state can only be paid with legal tender. If we were free we could all choose our own currency and we would generally choose gold or silver…this has also been taken out of circulation and hoarded by the elites. None of this information is given to the dumbed down masses. Islamic law says anyone who owns a commodity like gold and silver up to a certain threshold are required to pay Zakat (a religious tax) in kind, annually, which is then re-distributed to known categories of people in the locality. This enables the wealth to circulate in the community. Hoarding is discouraged, as is lending money and charging interest. So if the billion or so Muslims in the world just started to practice this, it would lead to their liberation, they could go on to create their own economic trading block where no banks are allowed, not even so called ‘islamic banks’ which are a trojan horse. Interesting reply but on a per capita basis, they own very little gold. Most gold is being routed to the Far East in China, Russia, India. Yes, Saudi and UAE have sizable stocks of gold in their central bank…. but they are owned by the extremists islamist elites. Lebanon is actually the country with the highest amount of gold per capita in the ME. With little property rights, poor human rights records, and extremists religious tendencies that tend to push the wealth to the pinnacle of the pyramid such as in Saudi, Iran, Syria, Libya, etc… There is no private ownership of gold that exists in any sort of quantity that can be compared to the international average.